outlines the necessary practices and approaches that social work must adopt in order to fight against oppression and privilege, and to assist those who have been oppressed. "This text is critical to social work practice in Canada. . . . It provides a thorough theoretical foundation to understand oppression. 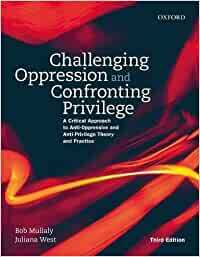 The chapter on privilege is essential for social work students." exploration of privilege and how we harm others without conscious intent . . . I love Mullaly's work." Bob Mullaly is senior scholar and former dean in the Faculty of Social Work at University of Manitoba. Juliana West is assistant professor in the Faculty of Education and Social Work at Thompson Rivers University. This is the only textbook I've ever read where the authors included bickering with anonymous reviewers of earlier versions of the manuscript. To me, that says a lot. No concerns with this purchase. It came as expected. A little over priced (like all textbooks) but came in great condition.